Boyds, Md. 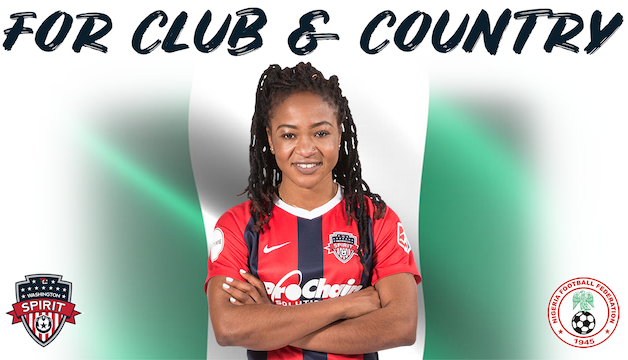 (November 16, 2018) – Washington Spirit forward Francisca Ordega will aim to help the Nigeria Women’s National Team secure a berth in the 2019 FIFA Women’s World Cup over the next two weeks at the Africa Cup of Nations. Three World Cup berths will be up for grabs during the African tournament, as 12 teams vie for the regional championship, in which Nigeria has seen unprecedented success throughout the event’s history. Nigeria has won the Africa Cup of Nations 10 times over the course of the tournament’s first 12 editions, and will seek to make it 11 this time around. Nigeria will compete in Group B along with South Africa, Zambia and Equatorial Guinea. The top two finishers in the two groups will advance to the semifinals, and three of those teams – both teams that end up reaching the Final, and the winner of the 3rd Place Match – will end up securing trips to the 2019 World Cup in France. The Super Falcons will open group play on Sunday, November 18 against South Africa.